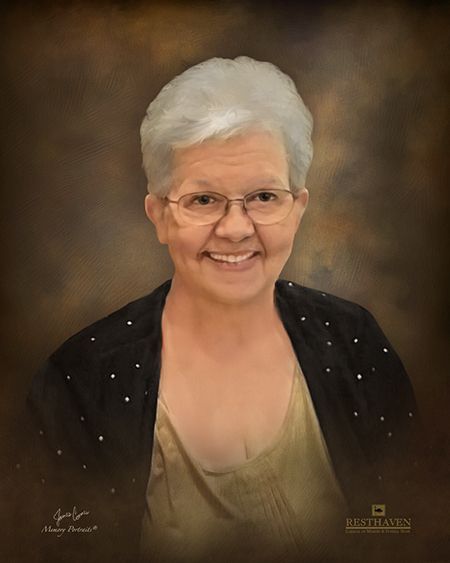 Iris Ann Troxclair, 73, passed away on April 10, 2019 at The Carpenter House in Baton Rouge, LA. She was a native and resident of Baton Rouge, LA. Iris was a devoted wife, dedicated mother, proud grandmother, loving sister, a faithful friend, and was known for her sweet smile. Her calling was to be a wife and mother, and she spoke often of God providing all she ever dreamed. Iris is survived by her two daughters, Aimee E. Hansen and husband William, and Carol C. Decoteau and husband Stephen; son, Donald J. Troxclair, Jr.; two grandchildren, Lauren Christine Troxclair and Jenay Christine Hansen; brothers, Wayne and Steve Delaune, and sister, Brenda Delaune Brown. Preceded in death by her husband, Donald Joseph Troxclair; and her parents, Woodrow Wilson and Lois Marie Delaune; her father-in-law and mother-in-law, Nicholas and Virginia Troxclair, and beloved brothers-in-law and sisters-in-law. Visitation will be held at Resthaven Funeral Home, 11817 Jefferson Hwy., on Sunday, April 14, 2019 from 5 pm to 9 pm and will resume on Monday, April 15, 2019 at Most Blessed Sacrament Catholic Church,15615 Jefferson Hwy, Baton Rouge, LA., from 10 am until Mass of Christian Burial at 11 am, conducted by Father Phil Spano. Interment in Resthaven Gardens of Memory. Memorial Donations can be made to Louisiana Organ Procurement Agency, Metairie, LA.